Week three is finally in the books and I finally got around to writing it all down here. As you may know, I’m doing a Whole30 on a budget this month. 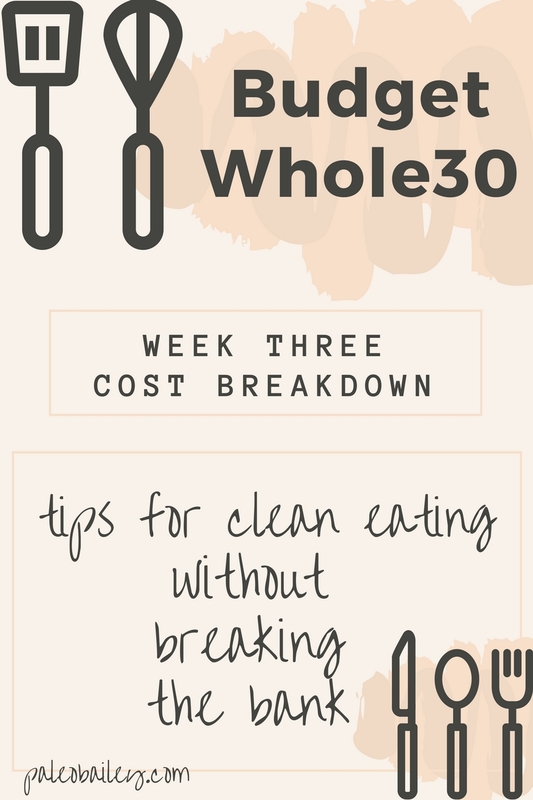 The goal of this is to simply show how eating whole foods and completing a Whole30 doesn’t have to be insanely expensive. It can, by all means, get really spendy… really quickly. 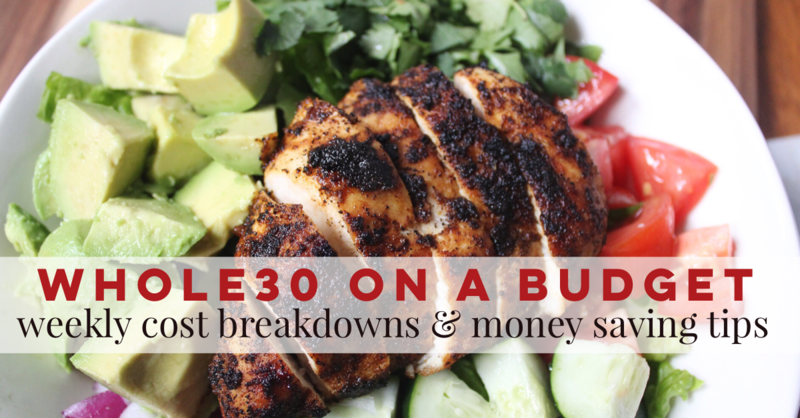 But this is how I do a budget Whole30 and I’m hoping it helps you save a few dollars, too! It was kind of a crazy week and I didn’t do much in terms of actual “meal prepping”. I made three “recipe” meals for meal prep purposes, pulled two things out of the freezer and the rest of my meal prep was roasted chicken, roasted veggies, and big cold tuna salad I had on salads a few days for lunch. Which, actually makes things cheaper. 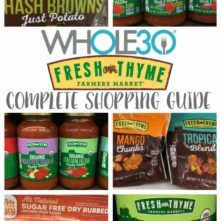 The less ingredients you purchase, especially the fancy ingredients that only a few recipes will ever call for, the cheaper your Whole30 will be. If you read my Week 1 and Week 2 post, you saw that I put some things I made into the freezer to pull out later. For weeks like this week they are SO helpful to have on hand for backup. I used the pulled pork for lunches and dinners with roasted veggies or salads. I made the taco meat during week 2 and didn’t end up using it all up. I continued eating it into week 3 but needed to purchase a bit more taco “toppings”. 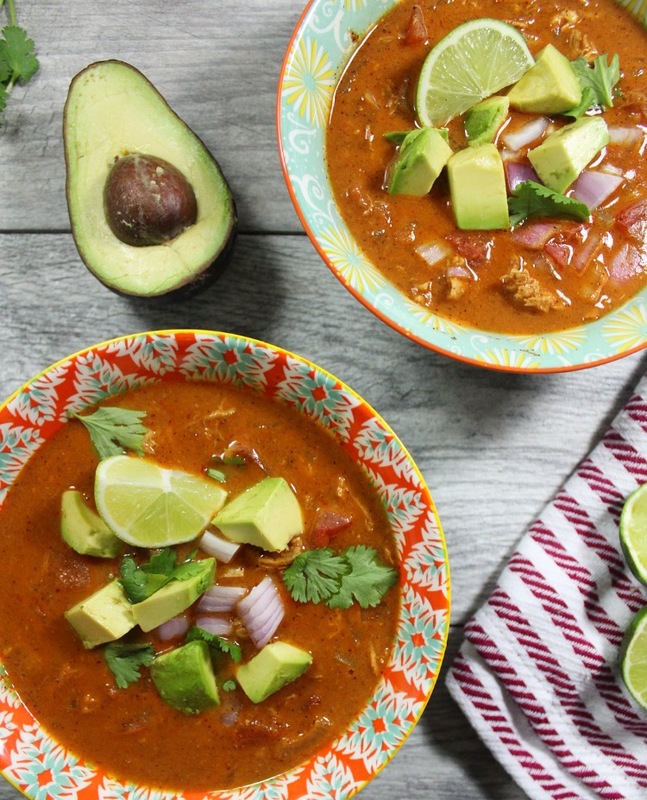 But, on a serious note, you don’t have to follow up taco salads with a taco soup. I could have done any number of things with those veggies. The lesson here is to sit down and plan your meals, then your shopping, around what you already have and using that up so it doesn’t go bad before you use the new foods you just bought. As I mentioned, I used a lot of meat and veggies that didn’t require a real recipe. That saves a ton of money and simplifies the process, too. I roasted chicken, broccoli, green beans and a few white potatoes I had left from week 1. I made tuna salad with the celery I bought to go with the chicken wings and some red onion I had left over from the taco soup. Those foods also happen to be some of the cheapest and I made them go a long way, getting even more bang for my buck. Just a quick note about just roasting things and throwing together meals: easy doesn’t mean it’s less delicious or not as flavorful as following actual recipes. There’s so many different spice combinations you can make with things you already have in your cabinets. You can add marinara on top of chicken and veggies or whip up an easy dressing with things you already have in the fridge to drizzle over it. Any of those will save you money and make it so that you’re not eating the same chicken and veggies every day for 4 days in a row. Check out my top 5 meal prep tips for more on that! 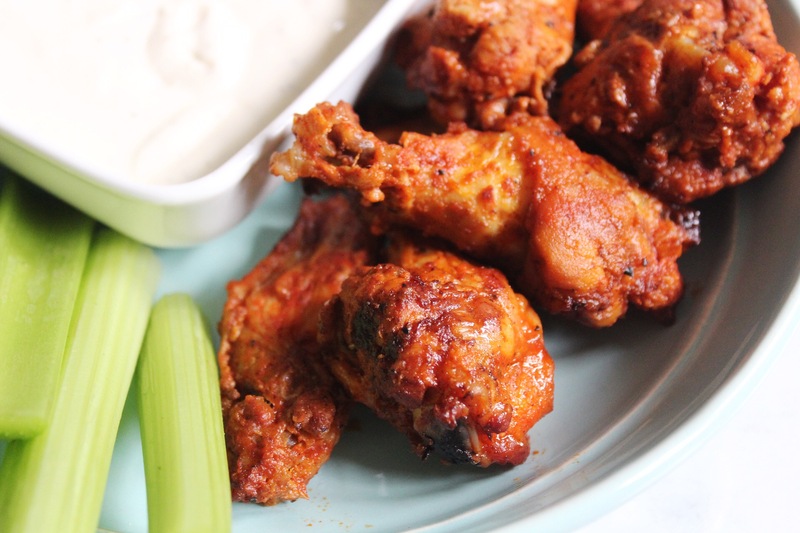 This week the only things I purchased at Target were chicken wings, Frank’s hot sauce for the buffalo wings and eggs. I was able to get the other veggies and meat at Aldi. If you remember from week 1, I purchased Aidell’s chicken and apple sausage from Target. I also used the last of the sweet potatoes I had and the last of the veggies from last week. During week 1, I talked about the staple items I keep on hand and/or purchase from Thrive Market (or other places, if I find good sales). 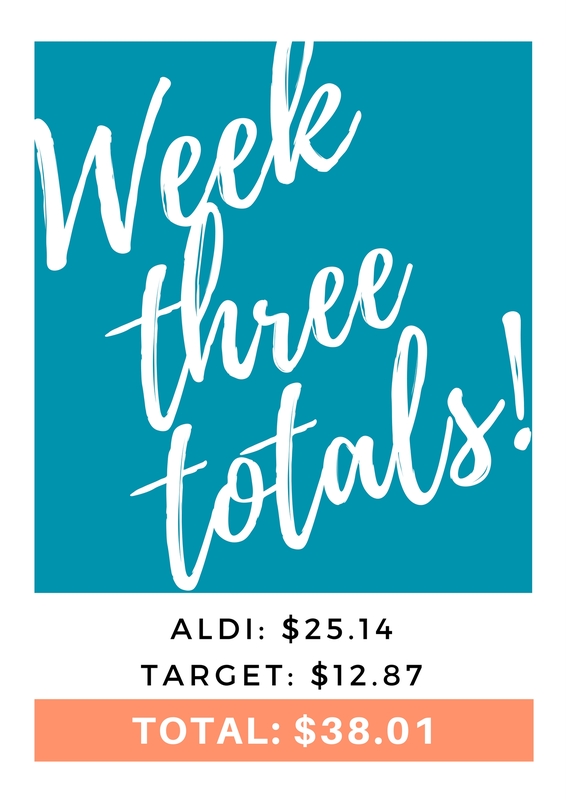 I used a bunch of those things this week that reduced my costs. I used coconut milk, broth and diced tomatoes, among other things. These are all fairly common items that people keep in their pantry. I had some of them for every day use before the Whole30 round or purchased them for my “staple items” just prior to starting. Having these things around already is helpful because I always get them at the cheapest price and buy a few of them at at time. I buy things broth (when I don’t make it), oils and ghee when they goes on sale, use sales and coupons (Target Redcard and Cartwheel coupon app) for canned tomato products and order multiples of canned coconut milk on Thrive Market. I hope this little experiment gives you a few ideas on ways you can reduce your food costs. I’m sure I could (or you could) get this even cheaper by shopping the sales and clipping even more coupons. There’s tons of ways to be even more thrifty. However, it’s important to decide how much time and energy you’re willing to put into getting the best deals. 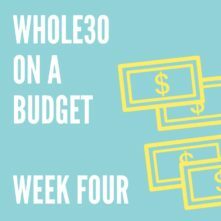 Sometimes, getting your food budget close to $35 dollars a week even though you know it could have been, say, $30, is good enough. For me, sometimes a few extra dollars is worth it to not use gas and time driving to that 3rd store, not spend those extra 2o minutes looking for coupons, etc. Have any money saving tips you use? Let me know! 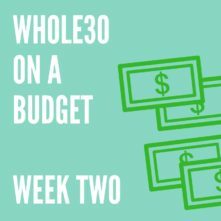 I’d love to hear from you about your budget Whole30 skills!